We stumbled upon Oktoberfest at Granite City Brewery. 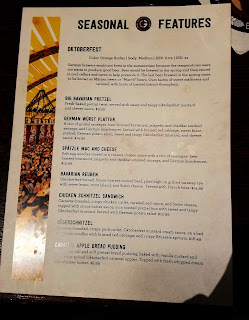 We stumbled upon Oktoberfest at Granite City Brewery (https://www.gcfb.com/) in late September. We eat there a lot and have ever since the craft beer chain opened here in 1999. First about the beer and food. With the special menu in front of us, it was easy to choose our dinner. A pint of the Oktoberfest Amber for me. Mike likes sandwiches and quickly chose the Bavarian Reuben. I was torn between the German Würst Platter and the Spätzle Mac and Cheese. A plate full of meat sounded really good and each had that, but the promise of the side dishes with the platter won me over. That’s what we ordered when we only had words to choose from. The stuff delivered to us surprised us in its size and its wonderful flavor. The Oktoberfest Amber had a smooth caramel flavor with hint of a tang for a finish. When the food arrived, I wasn’t sure how I was going to eat all that was on my plate. Had I seen one delivered to another table before ordering, I may have chosen something else. Maybe I wouldn’t like something and could leave it on my plate. Wrong! 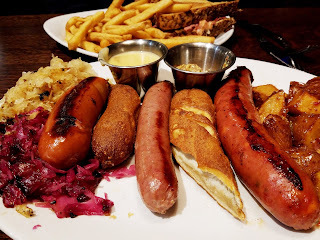 Each sausage tasted fresh, and flavorful and each was very tender. Pictured with this post are, left to right: German Knockwurst, beer-braised bratwurst, jalapeño and cheddar smoked sausage. I didn’t have a favorite. But I needed Mike’s help eating the last one. He liked the mix of cheese and meat and the jalapeno gave it a nice zing. I tried each sausage with a little of the tangy mustard, which was pretty good, but I’m not a mustard fan so don’t trust my word on that. The pretzels (pictured between the sausages), were more yeasty than I like but very tasty and went very well with the mild cheese sauce, which tasted freshly made. Now for that potato salad: I hadn’t remembered its description. It’s made with red potatoes with their jackets on -- unusual. Then I recognized the light vinegar taste and the bacon bits typical of a German potato salad (not the mayo and egg stuff) and devoured it. Yes, I cleaned my plate! Where to find this: Yes, Granite City Brewery started in St. 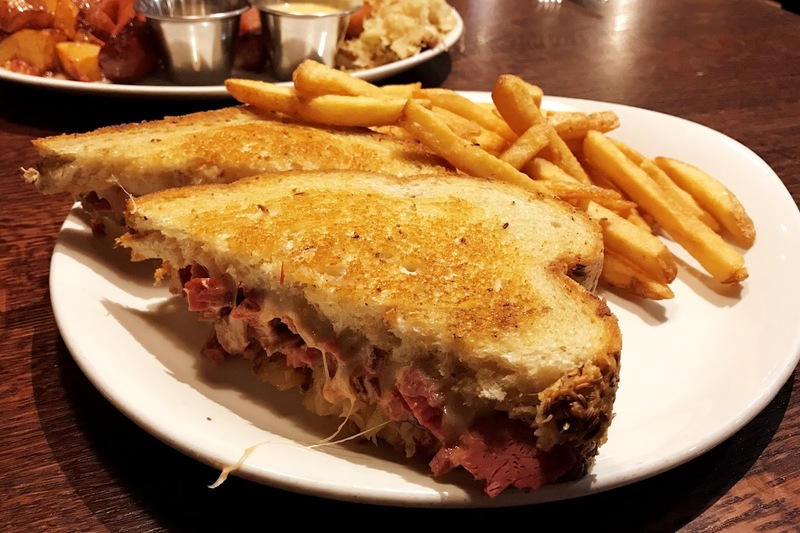 Cloud, MN, where we ate this meal, but there are now restaurants in 13 states from the Midwest to the Washington D.C. We’ve eaten in Maumee, OH, and three in Minnesota and plan to get to the one in Oxen Hill, MD, on our next trip to the capital. 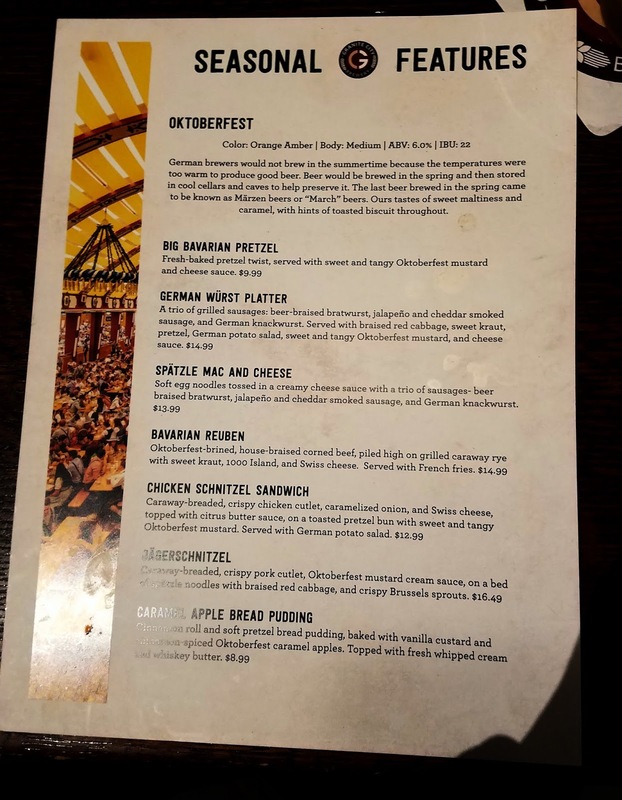 Their website warns that not all menu items are available at each location, but I’ve clicked on a dozen or more and each has Oktoberfest. Get it while it lasts!